John Carpenter's non-soundtrack album is engrossing and dark, bringing to mind images from his best works both audio and visual. While not every film in his catalogue has been a winner -- he does seem to have peaked and fallen after a heyday of successes) -- genius director John Carpenter has more unique successes completed on his own terms than virtually any other director. Even many of his derided and unsuccessful films have been re-evaluated and lauded with praise after their release. Critics may have hated The Thing (1982) upon its release, but it is widely and wildly acclaimed today. Many may have dismissed Dark Star (1974) as a somewhat silly comedy student film in space (with special note of the beach ball as the alien threat), but it has proven to be an enduring classic that enjoys almost universal acclaim. With respects to his initially acclaimed films, Halloween (1978) was a huge success that came virtually from out of nowhere, in the process redefining its genre and becoming one of the most influential horror films of all time. That praise has stood the test of time. Visually, Carpenter has made a number of masterful films as a writer and director. Furthermore, it is undeniable that one of the aspects of his cinema that has made his films so successful is the music. Carpenter, more often than not, scores his own films. Who can think of the chilling Mike Myers without hearing that disturbingly ringing piano theme from Halloween? Who can deny that the playful piano in the score to Big Trouble in Little China (1986) enhanced the action and comedy greatly? The surreal songscapes from Escape from New York (1981) were both unsettling and captivating, much like the desolate post-apocalyptic city of its title. The droning bass from the score to The Thing, written with the great Ennio Morricone, instilled a sense of foreboding that predicted the subtle yet terrifying thrills of the film to come. 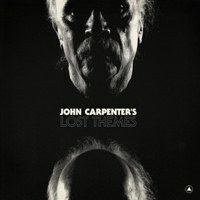 The title of Carpenter’s new album Lost Themes surely implies that we are getting a soundtrack’s worth of tracks that have been deleted from the fifteen films that he both scored and directed. This is, however, somewhat misleading. There are no unearthed motifs from Prince of Darkness (1987), no rediscovered cues from Assault on Precinct 13 (1976), no alternate measures from The Fog (1980), and no comical disco remixes from The Thing -- pardon my blasphemy there. Instead, Lost Themes is a collection of all original instrumental songs by John Carpenter, in collaboration with his son Cody Carpenter (a musician in the band Ludrium) and his godson Daniel Davies (a musician in the band By Maker). Lost Themes certainly sounds a lot like Carpenter, measure by measure, and in many places these songs represent Carpenter at his musical best. Right from the opening track “Vortex”, with its electronic rhythms and harsh, discomposing electric guitars, these Lost Themes etch out their own niche in some sort of crazy mixture of genres, at once electronic and poppy, metallic and heavy, and ultimately still suitable to grace the score of any sci-fi or horror film. Similarly, the second number, “Obsidian”, has Carpenter’s fingerprints all over it. One can almost see a movie title materializing over the light arpeggios of the first movements before the song traverses into a darker territory abruptly with no warning given or quarter granted. As “Obsidian” progresses, it’s hard not to imagine cast and crew names appearing in a stark white and clear font against a solid black background, perhaps giving way to a wet highway at night at high speed. While the Lost part of the title is not exactly accurate, the Themes part absolutely is. By the time “Fallen” invades one's headphones, it's clear that every single song on this album is actually a mini-score to a brief and unseen motion picture. As with “Obsidian” and “Vortex”, Carpenter fans can practically envision the very images that these sounds might grace. There are quite a lot of “dated” moments on this album; the entire affair sounds a lot like it should be contained within a dark, late '70s/'80s movie. The synthesizer-heavy record continues this theme with “Domain”. Were one to get into a car whose driver was listening to this fourth tune, the first thing out of his mouth might be, “What movie is this from?” Upon being told this is a new and original 2015 piece, he would have good reason to be surprised. This is, of course, not at all an insult to Carpenter or his talented music. The man who made us believe in invasion of alien conservatives in They Live (1988) didn’t get to his peak for any lack of talent. Had Carpenter turned around and put out some pop, country, or metal album in an attempt to compete with the top 40, he would most likely have failed miserably and been dismissed by the industry and the press. That’s not to say that he's not skilled enough to pull off such a feat; he has performed in many groups, including his own Coupe de Villes. Rather, it's to say that anything other than the kind of material on Lost Themes would not be truly Carpenterian. The fifth track, “Mystery”, lives up to its name and drives its way through many movements in just over four and a half minutes. Close your eyes and turn the volume up, and you could swear that you’re watching someone -- perhaps yourself-- running down a dark hallway full of dangerous doors, potentially with a madman behind each one. By this point in the review, one can guess that every single musical number is going to have some kind of nifty title that sounds like a John Carpenter movie. Case in point is track six, “Abyss”, where what starts off as a piece reminiscent of the Halloween theme slowly moves into an electronic and bass-heavy fast paced assault. Around this point on the record, something aside from the titles starts to feel similar. Carpenter is an amazingly talented pianist and composer, but this album is so synthesizer heavy that the overall vibe by the last half of the album is not only of the '80s but also of sameness. Of course, this could work on an actual soundtrack, where composers use repeated motifs and sounds to accompany the visuals and cue memories. However, the pieces on Lost Themes do not truly repeat themselves. Instead, Carpenter seems to be trying various new tricks and themes using the same tools. Track seven, “Wraith”, is a bit more diverse, with its use of heavy guitars and a rhythmic backdrop that sounds almost like rain falling. We are given an almost theremin-like synth procession that, while creepy, sounds a lot like the same note over and over. The impact tends to remind the listener more of New Age music than a chilling film score. That said, the guitar solo is fantastic, adding yet another redeeming dimension to an entrancing tune. Often, the sounds on Lost Themes are so electronic that instead of visualizing credits, one can actually see ones and zeroes dancing in the mind, or perhaps some of The Matrix's "digital rain”. While “Purgatory” is just as electronic, the sound of acoustic piano takes the spotlight about halfway through the song, sounding terrific. This gives way to a driving, low tempo drum-and-synthesizer progression with the same digital raindrop background, bouncing lines all up and down the equalizer. While not continuing the same music from the eighth track, “Night” begins with another driving, synthesized bassline accompanied by orchestral hits, otherworldly wind sounds, and ambient electronic buzzing which fades in and out of the songscape. Again, however, the same, familiar synthesizer notes soon take center stage again, bringing the piece back to the known. Carpenter does make great music, which is certainly present on Lost Themes, but there is something missing without the visuals that he is proven to be even better at. Perhaps the answer is that Carpenter cultivated such a unique sound for his films of the '70s and '80s that it is nearly impossible to hear a style this close to his score work and not imagine one of his films right before your eyes. This is not to say that listening to Lost Themes is not time well spent; it truly is an enjoyable and oft-thrilling album, in spite of some of the sameness in many of these tracks. Should anyone (hopefully Carpenter himself) create a dark period-piece thriller or just a Carpenter-esque science fiction or horror film, Lost Themes contains nine tracks that would formulate one hell of a soundtrack for said film. Luckily there are also six bonus tracks on the album consisting of remixes. The Dean Hurley/Zola Jesus remix of “Night” would be perfect for a closing credits sequence considering the fact that, unlike the original number, the remix contains lead vocals which enhance an already bewitching song. Remixes of “Wraith”, “Vortex”, “Abyss” and two different takes on “Fallen” close the album. Interestingly enough, the repetition of these songs actually serves to strengthen Lost Themes even more, making the album sound more like a unified soundtrack with common motifs and repeated cues and measures, rather than merely similar sounds with the same instruments. Whether or not something feels missing without Carpenter’s imagery, the album must be judged by its own merits and Lost Themes is more than worth the time to listen. This is proof that Carpenter never stops having great ideas, at least musically, even (or maybe especially) if the music he creates feels firmly set in a certain era. He remains a true renaissance man, with virtuoso skills behind the camera, pen, and keyboard. Fans may still be clamoring for him to unleash another movie; following 2001’s debacle Ghosts of Mars, he has directed only 2010’s The Ward and two episodes of Showtime’s Masters of Horror series. Lost Themes is a quality milestone, perhaps even a step toward getting more Carpenter in at least one medium.